• Reducing disturbances and harassment of nesting sea turtles by public education about the hazards of nighttime beach activities, habitat destruction, and beach lighting. • Increasing the hatchling survival rate by educating the public about the impact of lighting, beach debris, habitat destruction, and marine pollution. • Supporting the Archie Carr National Wildlife Refuge by overseeing the management of the Carr Refuge Fund. • Rehabilitating hatchling sea turtles and when required, transporting injured sea turtles to rehabilitation facilities for eventual release back into their natural environment. • Contributing stranding data to the Sea Turtle Stranding and Salvage Network through efforts to respond to reports of sick, dead, and injured sea turtles, collectively, called stranded turtles. • Participating in Keep Brevard Beautiful, Adopt-A-Beach program by performing monthly clean-up activities at Coconut Point Park in Melbourne Beach. • Conducting nest surveys near Cocoa Beach and contributing data to the states database. • Distributing current information on sea turtle related issues through a quarterly newsletter called Turtle Talk. • Conducting state-sanctioned nighttime beach walks during nesting season to introduce visitors and residents to sea turtles and the issues threatening their survival. 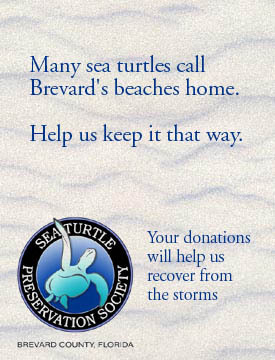 The STPS relies solely on the donations from the public, its membership, and the efforts of its dedicated volunteers to help protect Florida’s endangered and threatened sea turtles. Nancy Yates, who coordinates public outreach and emergency stranding efforts, has watched the Society expand over the years. “We’ve come a long way in the last few years, we’ve expanded our public outreach to reach thousands of residents and visitors, and have grown into the largest stranding recovery organization in the state, all without any paid employees,” Yates said. The society hopes to reopen their office once repairs are made, with late December as the tentative reopening date. Donations are desperately needed by the Society to replace office equipment, furniture and educational displays destroyed during the storms. Yates said “Our office generates the bulk of the funds we use to fund our conservation efforts, we hope to be open in time for the holiday season but are unsure of when the building will be in condition to open.” Donations can be sent to the mailing address listed below.